The community of Matimekush, which means “little trout”, is located on the shores of Lake Pearce, about 510 km north of Sept-Îles. The community of Lake John was transferred from the provincial to the federal government in 1960, during the golden age of neighbouring iron ore mining exploitation. In 1968, Quebec also transferred what is now the Matimekush reserve to Canada. In May 1998, the Governor in Council granted a decree that set aside 131 acres of land for the use of the Schefferville Innu band. 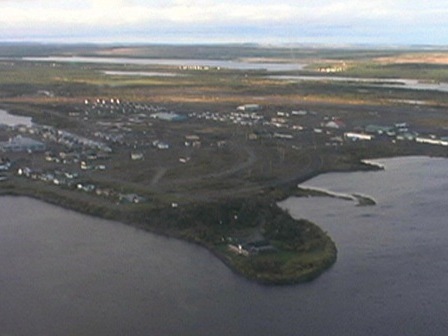 Matimekosh is located on the shore of Lac Pearce, approximately 510 kilometres north of Sept-Îles. Lac John is located 3.5 kilometres from Matimekosh and the centre of Schefferville. The local economy is based chiefly on goods and services businesses as well as construction. The Corporation de développement économique Matimekush - Lac John is the organization responsible for local economic development. There are approximately 10 businesses on this reserve: services such as a convenience store, pharmacy, heavy equipment, auto mechanics, camping equipment and supplies; plumbing, gas station, outfitters, video rental. Police services: Provided by the Aboriginal police force recognized under an agreement between the Band council, the Government of Canada and the Government of Quebec. Medical care: Nursing station managed by the Band council under a transfer agreement with Health Canada. 3:53 min. - Schefferville was built very quickly after the discovery of minerals. The presence of Whites multiplied daily. Many Indians from other communities came here, particularly from Uashat and Mani-utenam. Uldéric Mckenzie - How was Schefferville founded? Schefferville was built very quickly, a large amount of equipment and materials arrived all at the same time. Every day brought more and more Whites. Many Indians came from other communities, particularly from Uashat and Mani-utenam. We lived in a tent, where the airport is now. Then we moved to Lake John, a ramshackle village. We built our houses with huge cardboard boxes and pieces of wood. We used anything we could find. Mathieu André found rock on his hunting territory. His land was in that area. Development started from that time on. Many people came, they built everywhere. Then, the Naskapi came from the North to live with us in Lake John. In my opinion, selling one's land is like selling your soul.